Christmas Week: Breakout or Fakeout in FX? We all know that liquidity drives up during the holidays but does that mean that breakouts are more likely or fake-outs? Based upon how the EUR/USD and USD/JPY have traded over the past decade this week, the odds favor a fake-out over a breakout. 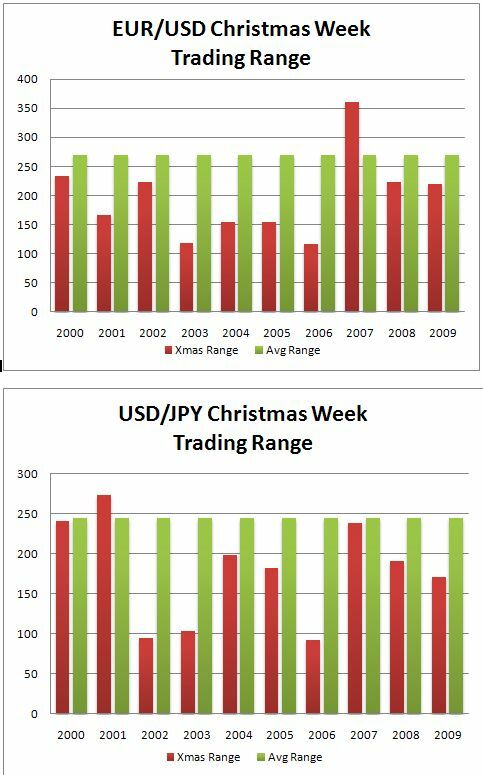 The following charts compare the trading range during Christmas week in the 2 currency pairs (red bars) to the average weekly trading range for the past 10 years (green bars). For the EUR/USD aside from 2007, the trading range this week tends to be below average. For USD/JPY the weekly range has also been below average every year except for 2001. In fact, the average trading range this week in the forex market tends to be approximately 25 percent less than the average trading range throughout the course of the year.